A new game of the BrickShooter for Mac family. 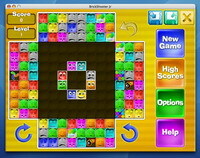 This game will work on any Apple Mac computer with Mac OS X.
BrickShooter Jr. for Mac is a new variant of the popular and challenging game for strategists of all levels from children to grand masters. It contains special options that make the game play more enjoyable. Enjoy solving each puzzle and take your own sweet time doing them!